GLEN SANNOX - fitting out alongside at Fergusons Marine Port Glasgow. The funnels have been removed since she was launched to allow the fitting out process to continue. Check out Jim McQuarrie's photograph taken on the 21/11/2017. Yeah but, even though I'm a Scot, my bus pass doesn't work in Scotland, you rotten lot! 70 something Bob (Bus pass)??? This pic makes me feel old. 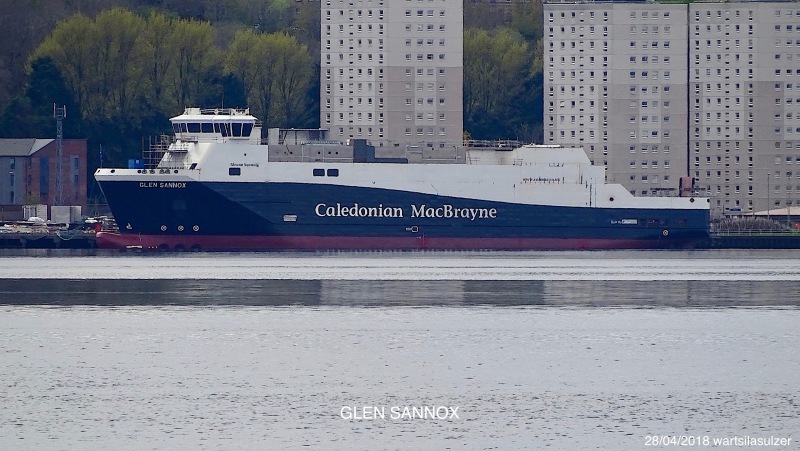 I remember getting excited to be going to Rothesay on the then-brand-new, really-modern-looking, 1957-built GLEN SANNOX (see http://www.shipspotting.com/gallery/photo.php?lid=2530391). Wonder why she needs a new bow? She has not even been out on sea trials yet. Hah hah!  well now Jim it did not take you long to spot this photograph, I was actually standing at position 055º57'36 north - 004º39'16 west, and that is the parking spot right in front of Cardross Railway Station on the north bank. I use a Sony and I was quite pleased at how the shot turned out. I didn't have a tripod with me and used a mono pod instead. I'm sure CalMac will give the lady a fresh coat of paint before they put her into service. She has spent all winter on the river and the white is no longer as pristine as it was when you took your photographs last year. Installed power: 2 × Wärtsilä 34DF diesels. This photo has been shown 1,178 times since it was added to the site.